This lovely serving came to only 300 calories and 10 grams of fat approximately. Totally reasonable for a dinner portion, you can even pair it with a salad if you are still feeling hungry. Plenty of calories to spare! about 3 cups of defatted turkey broth (I’ll post some details about how I make mine later this week), chicken will do fine too. 1 cup cremini mushrooms, slice as many as you want and purée the rest if you are like me about the texture. Heat the broth in a separate saucepan on low, you don’t want it to boil just be hot. Heat the canola oil in a skillet or pot. Add the diced shallot and cook until translucent. Add the sliced mushrooms and cook until they are browned on the edges. Add the garlic, rosemary and about 3 tbl of the mushroom purée if you did this. Cook two minutes. Add the rest of the purée to your broth and stir. Add the rice to the skillet and turn the heat to low. Stir, once the kernels are a bit shiny and translucent add the white wine and cook until the wine has reduced by half. Add 1 cup of the broth to the rice and stir slowly until it has been absorbed into the rice. Continue to add the broth one cup at a time, stirring slowly and letting the rice absorb it before adding the next. 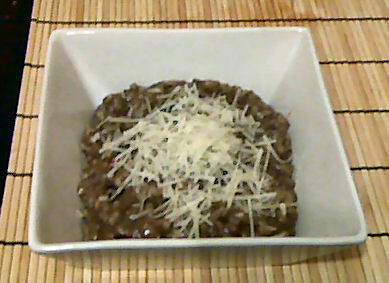 The risotto is done when it is creamy on the outside and slightly firm on the inside. This usually takes about 20 to 25 minutes. Stir in the parmesan cheese. Season with salt and pepper. Divide into dishes and top with extra parmesan cheese if you like. I added about 2 tbl on top of mine and added the calories to the total for the recipe. This made for such a lovely dinner last night for the two of us. It was creamy, full of mushroom flavour, and most of all satisfying for my foodie urges. Risotto sounds so intimidating when you hear those chefs being yelled at for their on shows like Hell’s Kitchen but it really isn’t. When you don’t have chef Ramsey in your face all it takes is stirring and patience and a tasty rich dish will be yours to savour in no time! This entry was posted in Dinner and tagged mushroom, risotto. Bookmark the permalink.